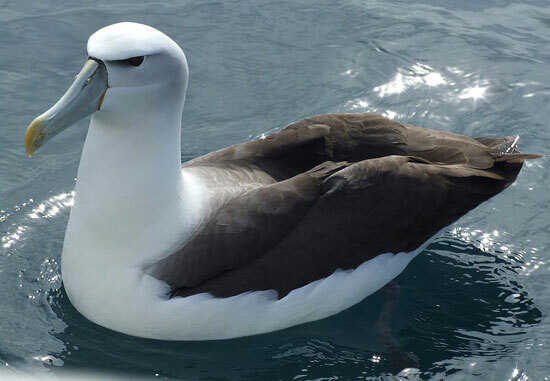 Black-browed Albatross: Common on the open sea in the southern oceans, rarely crosses the equator. Prefers to nest on slopes or cliffs overlooking ocean. They are long-lived birds surviving 30 years or more and have a strong attachment to their colony of birth. They will tolerate other bird species near their nests but other albatrosses are not allowed closer than about one and a half meters. When landing, the Black-browed Albatross lowers its webbed feet and uses them as brakes to slow its flight. A group of albatrosses are known collectively as a "flight", "rookery", and "weight" of albatrosses.